Here’s a fact: By 2020 there will be as many as five different generations working side-by-side. For live events business owners and industry professionals, what this essentially comes down to is a need to manage five different sets of expectations, demands, challenges and differences. 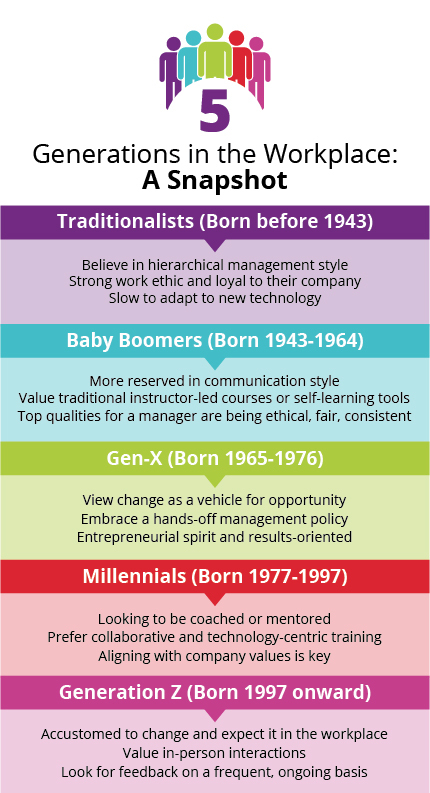 It is time to focus on the strengths of each individual—based on their generation. Here are a few tips to help a multi-generational workforce succeed as one collaborative unit. Multi-Recognition Approach: Stray from the one-size-fits-all recognition program when it comes to achievement. Instead, find out what motivates each generation and reward accordingly. For instance, Boomers may value recognition of their experience, while Millennials value personal growth and development opportunities. Keep the Pulse: Conducting regular surveys related to employee demographics and needs is a good practice to keep you in touch with your employees. A Learning Experience: It could be time to establish a mentoring system to help younger employees learn from older employees. Encourage the Tech: Younger employees should be encouraged to step out and lead the technology components of events. The results could help your business grow. Step Outside the Office: Hold team-building events outside the office. For some, it becomes a safe environment to be themselves and get to know their co-workers on a different level.